As the sun casts it’s early morning rays on a beautiful patch of countryside the clock starts ticking. You’ve got to crack on and build a holding cell to detain the job­ lot of maximum security prisoners that are trundling to your future prison on their yellow bus. As your workmen lay the last brick you don’t have a moment to let them rest as they need to get started on the first proper cell block so you can make room for the next prisoner intake. Once they’ve all got a place to lay their weary heads the fun can really start. Finished your supermax? Got guard dogs roving every corridor and prisoners eating out of your hand? Now you can live the horror by firing up escape mode and play as a prisoner hell-bent on getting the hell out of dodge. Dig a tunnel, go for the armoury or start a riot and slip out in the chaos, it’s entirely up to you! 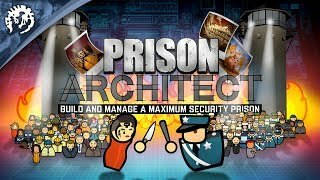 Figure out how to escape from your own creation, or hit the random button and load one of the 12,000 prisons. Operating System: 10.11 (El Capitan).